The international rating agency Moody’s has downgraded Russia’s Structured Finance collateral outlook from stable to negative. It expects low oil prices, a weakening ruble coupled with depleting foreign exchange reserves will erode growth. Moody’s expects a decline in GDP of 5.5 percent in 2015 and forecasts unemployment in Russia will rise to seven percent in 2015 and eight percent in 2016, from 5.2 percent in November 2014, it saidin astatementThursday.Although Moody’s does not have a specific wage level forecast, it says it’s likely that real wages will decline along with the GDP growth rate. “Moody's expectation that the substantial oil price and exchange-rate shock will further undermine the country's already subdued growth prospects over the medium term," it said. Structured finance involves highly complex financial transactions offered by many large financial institutions with the aim to help transfer risk. It includes such tools as collateralized bond obligations (CBOs), collateralized debt obligations (CDOs), syndicated loans and synthetic financial instruments. On 16 January Moody's downgraded Russia's government bond rating to Baa3 from Baa2 and placed it on review for downgrade. The price of oil has lost more than 50 percent since the peak in June 2014, with Brent trading at $55.91 at 16:00 MSK on Thursday and WTI at $49.66.The Russian ruble has seen a steep fall in its value of more than 50 percent since the beginning of 2014, it’s being traded at 66.6 rubles per dollar, and 76.08 per the euro at 16:00 MSK on Thursday. Russian gold and foreign currency reserves have reduced by $1.8 billion in a week and currently stand at $376.3 billion. Earlier in January S&P cut Russia’s sovereign debt rating to a ‘junk’ status. Downgrades by the West’s biggest rating agencies have been criticized for being political and not reflecting the underlying economics. There has been a bringing to book, as on Tuesday, S&P agreed to pay US prosecutors a record $1.4 billion to settle claims it misled investors ahead of the 2008 financial crisis. 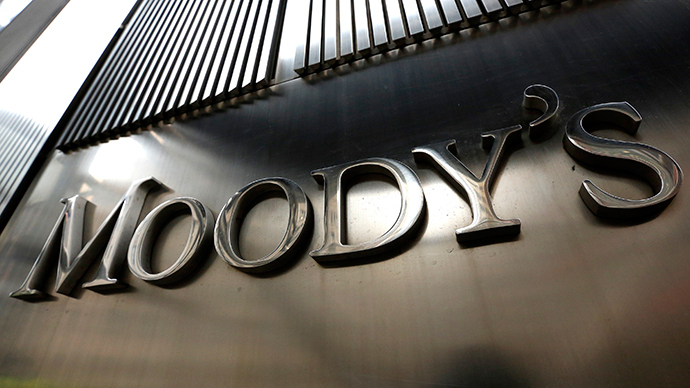 The Attorneys General in Connecticut and Mississippi are among the prosecutors stepping up their examination of Moody’s as it is suspected of issuing favorable ratings on mortgage bonds to win business before the crisis.